Here's what the research says about diet and depression. If you've ever found yourself in front of the TV after a bad day, mindlessly digging ice cream out of the container with a spoon, you know that mood and food are sometimes linked. But while stress eating is a verified phenomenon, the relationship between food and actual mood disorders, such as depression, is less clear. Or, to put it another way: can the things you eat influence your risk for depression — and can dietary changes potentially improve your mental health? "The research regarding dietary factors and depression is still inconclusive," says Patricia Chocano-Bedoya, a visiting scientist in the Department of Nutrition at the Harvard T.H. Chan School of Public Health. But there have been hints that food may play a role in depression. Research using data from large observational studies — like the Nurses' Health Study and the Women's Health Initiative, which included middle-aged to older and mostly postmenopausal women — has found links. This includes a 2005 study in the International Journal of Obesity, which found associations between obesity and depression and dietary factors. Also, a 2011 study in the American Journal of Clinical Nutrition found that women who ate more vitamin D–rich foods had a lower risk of depression than women who got less vitamin D in their diets. But conclusively linking your diet with your risk of depression is another story. It's not yet possible to identify a single nutritional factor that increases or decreases the risk of depression, says Chocano-Bedoya, a senior epidemiologist at the University of Zurich. "There is limited evidence regarding risk of depression associated with unhealthy dietary habits," she says. A 2014 study in Brain, Behavior, and Immunity that used data from the Nurses' Health study did find an association between depression and a diet rich in sugar-sweetened soft drinks, refined grains, and red meat, says Chocano-Bedoya. Similarly, a 2018 meta-analysis published in the European Journal of Nutrition suggested that high consumption of meat could be associated with risk of developing depression. However, at this point, there are so many different factors associated with depression it's not possible to tease out exactly how much a specific food or dietary pattern affects risk, she says. "Modifiable lifestyle factors such as dietary choices, smoking, and physical activity could potentially affect depression risk but do not act independently," says Chocano-Bedoya. Depression, like many other chronic conditions, likely results from a complex interaction between genetics and environment. "While we can study what modifiable risk factors can be associated with depression, we cannot estimate what percentage of depression is associated with a specific factor, as they are mostly interrelated," she says. That said, there's still good reason to focus on your diet in the hopes of protecting your mental health. "There is consistent evidence for a Mediterranean-style dietary pattern and lower risk of depression," says Chocano-Bedoya. A Mediterranean diet is rich in fruits, vegetables, olive oil, whole grains, and lean protein such as chicken and fish, and low in red meat and unhealthy fats. Even if future research determines that a Mediterranean diet doesn't have an effect on depression risk, there are still numerous other reasons to adopt this eating plan. 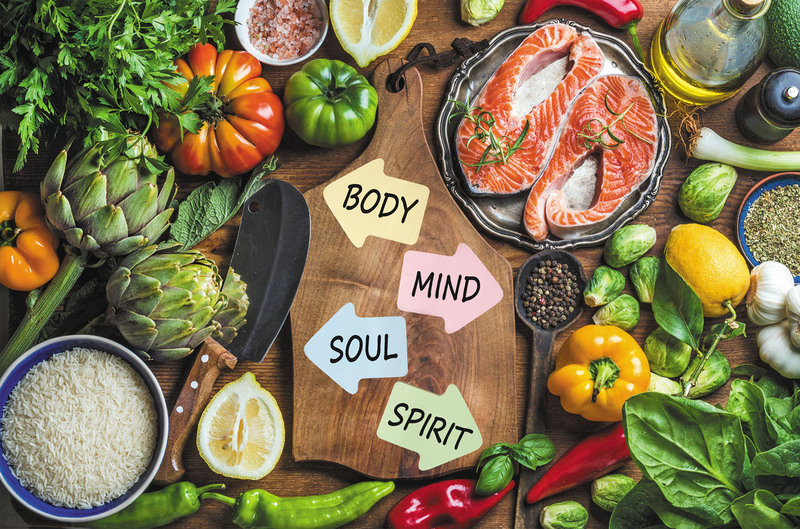 "For instance, the Mediterranean diet has also been associated with lower blood pressure, better cognitive function, and lower incidence of diabetes and cardiovascular events," says Chocano-Bedoya. "I would recommend an overall healthy, high-quality dietary pattern, such as a Mediterranean-style diet, not only for the potential to reduce depression risk but also for overall lower risk of other chronic conditions, which in themselves may later increase the risk of depression."